EMDR, or Eye Movement Desensitization and Reprocessing, is a partially physical treatment in psychotherapy used to reduce psychological pain associated with trauma. It involves watching a light move back and forth, tapping your hands on your legs, or holding two small vibrating paddles, one in each hand, while letting your brain relive a traumatic event. The physical component (be it the moving light, the tapping hands, or the vibrating paddles), causes bilateral stimulation. When combined with the brain’s amazing ability to make sense of complicated feelings and situations, effective healing can occur. We have two hemispheres in our brains; the right hemisphere and the left hemisphere. They are connected in the middle by a part of the brain called the corpus callosum. The corpus callosum does the job of communicating thoughts, memories, emotions, and other information between the two hemispheres. When you experience a traumatic event, your brain makes a fixed memory, including all of the physical and emotional feelings you had at that moment. This is sometimes referred to as a “flashbulb memory” (flashbulbs were used with old cameras as the necessary light source for a photo), because the image is frozen in your mind in great detail, and details will remain there, largely unchanged, for years. It is important to note that most memories are extremely flimsy and subject to change, even from hour to hour. Flashbulb memories are different. They are “stuck” in a neural memory network in a specific part of your brain and are cut off from the rest of your brain. Anything that comes in contact with this “stuck” part of your brain will be negatively affected by your trauma. The stuck trauma can cause negative thoughts, feelings, and behaviors. This is where EMDR comes in. Bilateral stimulation means that both hemispheres are stimulated alternatingly (right brain, then left brain, then right brain, then left brain, and so on). Bilateral stimulation is the crucial element in EMDR because it aides the corpus callosum in communicating between the two hemispheres of the brain. Switching so rapidly from side to side helps break up the “stuck” memory, and put its emotional components back into more appropriate or healthy places in your brain. In layman’s terms, bilateral stimulation allows troubling thoughts and feelings to go back into the parts of the brain where they belong. So what happens when you undergo EMDR? With the help of a therapist, you take an initial reading of how disturbing the traumatic memory feels on a scale from 0-7, and then how true a specific, applicable negative statement of your choosing about the memory (Ex. “I cannot protect myself”, “I should have known better”, “I am worthless”, and so on) feels on a scale from 0-7. These numbers are your baseline, and you will revisit them before and after each session, with the ultimate goal of getting to a reading of 0 in terms of how disturbing the memory is and a reading of 0 on how true the negative cognition feels. You will also choose an opposite, positive statement that you would like to believe (“I can protect myself”, “I can trust my judgment”, “I have value”) and will be asked how true that statement feels on a scale from 1-10 at the end of each session to assess your progress. When you start the process itself, you will take a tapper into each hand (I will use the vibrating paddles, also called “tappers”, for this example, since this is the method my therapist uses with me) and the therapist will tell you to close your eyes and put yourself into your memory of the trauma. She will start the tappers and adjust the speed and intensity of the vibrations. She will tell you to take a few slow, deep breaths, and to bring the traumatic memory up in your mind. After that, she will fall silent, and you will be in your own head. You start at the specific traumatic memory, but your brain will move to other memories and thoughts, and sometimes even daydreams or fantasies. All of this is normal and helpful. My therapist says that “the brain knows what it needs” and will take you wherever it needs to go in order to heal itself. I’ve had memories, affirmational true thoughts, and even daydreams where my adult-self interacted with my child-self in a very old memory. I’ve been told that this is common; sometimes the adult-self will enter a childhood memory to offer support or guidance to the remembered child-self as part of the healing process. There’s no wrong way to process. The only time you’re not “doing it right” is if you shut down and stay in a pleasant, unrelated memory out of fear of processing the trauma, or you get stuck on one thought and can’t move forward. Even if this happens to you, don’t fret, because this is why you’re doing this with a trained therapist. Your therapist will stop you every few minutes, tell you to take a deep breath, and ask you what you are experiencing, and as long as you haven’t shut down and you’re not stuck in the same place you were the last time she checked, she will just say “Good. Go with that”, and you will close your eyes, resume bilateral stimulation, and continue to mentally wander. If you do shut down or get stuck, she will bring you back to the initial memory with which you began your session, and you will go from there. If you continue to get stuck, your therapist may choose to end your EMDR session for the day and go into “Safe Place” to calm down. “Safe Place” is a place of your choosing, real or imaginary, where you feel calm and safe. You bring it up in your mind and try to imagine every detail of what you would sense if you were really there. Sight, smell, touch, sound, and taste are all part of the total picture of your safe place. You hold the tappers and use Safe Place to end your session of EMDR, whether you got stuck or you were able to do an entire session. Your therapist will turn down the speed and intensity of the tappers while you meditate on your safe place. After a couple of minutes, she will switch the tappers off and tell you to take a deep breath and open your eyes. She will ask you what your distress level is. If you are still bothered, you will do another few minutes of Safe Place. You can choose to do multiple sessions of Safe Place if that’s what you need to calm down. This is your journey of healing, after all. Lastly, your therapist will take down the new measurements of your distress level, how true the negative statement feels, and how true the positive statement feels. This record is important for keeping track of your emotional responses to the treatment, especially if you do multiple sessions, which most people need. The first one or two sessions of EMDR are intense and can be very upsetting, but the benefits are enormous because you can change your entire perception of a lifelong trauma in (possibly) as little as three weeks in a row of one session a week. You can change the way you relate to a memory that has haunted you your entire life. It is recommended that on days that you do EMDR you set aside some time after your appointment to relax, write, meditate, or cry; time to do whatever you do to calm down. EMDR can trigger bad feelings. It can also trigger seemingly unrelated memories for weeks afterward. These memories can be positive, negative, or neutral, and may not have anything to do with your processing. This is your brain “rearranging” itself, and is common. There are multiple types of EMDR: traditional and feeling-sense. What I described above is traditional EMDR. Feeling-sense is slightly different. I used both methods to address my issues with food and overeating. Feeling-sense is when instead of starting with a traumatic memory, you start with all the physical and psychological feelings you have while doing an unwanted but pleasurable activity, like overeating. You focus on this feeling, living through every moment while holding the tappers. Every few minutes, you will be stopped and the level of intensity of your desire to engage in that activity will be measured. Your goal is to get to a measurement of 0 desire to engage in that activity. You repeat the process of thinking through the pleasurable activity as many times as it takes to get down to 0. You can choose whether or not to conclude with Safe Place. EMDR was controversial at its inception, but the more studies come out, the more evidence we have that it works. I am not a doctor or therapist; I am only a patient. I know it has worked well for me on several issues in my life. My EMDR work on my relationship with food helped me lose 120 pounds. Now it feels really good to eat well and rather unpleasant to eat a pot full of Kraft mac and cheese. It has also helped me with traumatic childhood events that gave me problems with negative emotions and behaviors as an adult, and I don’t have those problems or engage in those behaviors anymore. EMDR is a relatively fast way to address deep-seated wounds. It can change the way you relate to both your trauma and the painful feelings that have built up on top of that trauma for years. I believe in this technology, and I am grateful that this tool is available to me. If you are in the market for a therapist, it would be well worth your while to find one trained in EMDR. 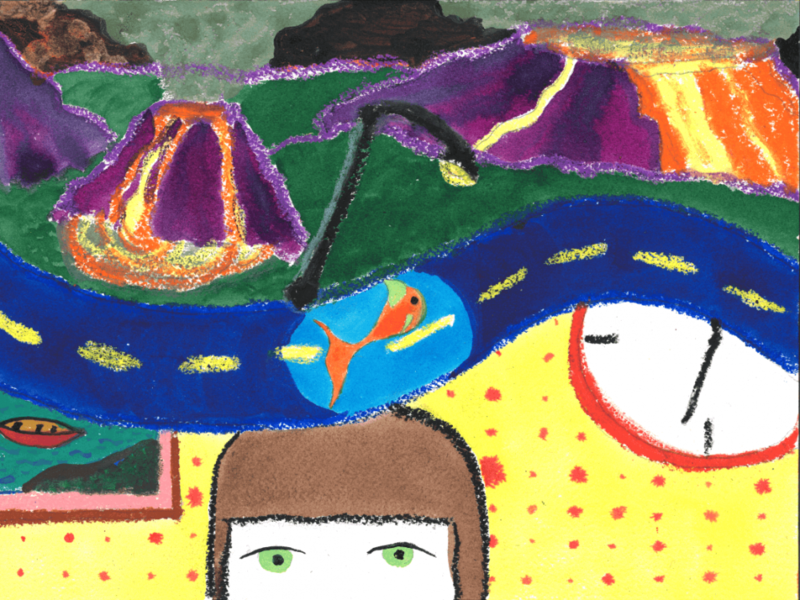 This entry was posted in EMDR, Practical Aspects of Living with Mental Illness by goldfishpainter. Bookmark the permalink.